Hairy Maclary from no dairy. Did you know that Hairy Maclary from Donaldson’s Dairy is from New Zealand and that in New Zealand a dairy is a milk bar/corner store? I always imagined that Hairy Maclary was a ‘small terrier of indeterminate breed’ from an actual dairy – like the old Haberfields dairy we used to visit occasionally when we were kids. 1. I’ve started reading to little man. So far I am disappointed as he appears to be more the worm than the book part of a ‘book worm’. My sister and I were READERS. I know little man is well, little but I really hope he grows up being into books. So we’ve started with Hairy Maclary. Next up – Harry Potter! …or maybe some Dr Suess. 2. I’ve given up dairy. For lent! No, not for lent. For little man. But if anyone asks – totally for lent. I just thought of that. Anyway, a few people have suggested a dairy intolerance might be causing the reflux. The paediatrician suggested giving up breastfeeding and switching to a formula which smells like rotten eggs, that he ‘probably won’t like the taste of’ and which ‘smells pretty bad when it comes back up’, or I could try giving up dairy. Because its more likely a ‘cows milk protein intolerance’ not a lactose intolerance it means NO dairy. No yoghurt, no cheese, no butter. Its a real [insert swear word of your choosing]. I’ve found it ridiculously hard. Breakfast is my favourite meal of the day and I almost ALWAYS have bircher muesli. Or as I was calling it “devil food”. Not really, but its difficult to do nice bircher muesli without yoghurt and milk. Of course coffee has been a nightmare. Even before giving up dairy I was struggling with having to limit myself to one ‘real’ one a day. Not that I ever had more than that but it was nice to have options for a bad day – more caffeine! So anyway I gave almond milk a go. I can’t even…it was pretty bad in coffee. Soy milk? The man picked some up from the supermarket for me. Vitasoy – lite. Light soy milk? Really? REALLY?? *sobs*. Then I just hardened up and switched to drinking my coffee black. Black – like my life without dairy. Nah, I actually acquired a taste for it. The only thing thats kind of annoying is that with a short black your caffeine fix is over so quickly! So yes, about two weeks now on the long blacks/short blacks..until today. My friend Ann arrived on the scene with Aldi soy milk and that – with my aeropress, fresh coffee beans and a milk frother gave me the first really enjoyable coffee I’ve had in two weeks. I enjoyed it so much I even went to Aldi this afternoon and bought some myself! I am going to attempt yoghurt less bircher tonight so hopefully brekky tomorrow will be alright. Oh and – its been two weeks and I’ve seen zero improvement in the reflux. Someone suggested yesterday I should be cutting out gluten too. Yes – I’m a bit grumpy without milk. Some days its all I can do to count down the hours until the man gets home from work. Not because I can do the baby handball – although the thought of being able to do that is nice “take him”. Just because then, there’s two of us and it doesn’t seem so bad when there’s a teammate you can ‘tag’ in. I don’t feel bad writing this. Other mothers will get it. Especially Cherie over at Raising Master Max who is doing it way tougher than me. Today was not a good day. But I know parts were good, so thought I’d go over those. – Little man’s grins at 5:05am this morning. He was absolutely ecstatic to see me and it made me laugh out loud. He is a crack up. Can’t wait until he actually laughs too! – The coffee my friend Shell brought me, who then looked after little man so I got a shower today and then I got an hour down the street (to question pharmacists about losec – his reflux medication has been turning brown. Doesn’t seem right to me! Anyone know anything about it?). Oh and I made it to the post office to post a few things I’ve been meaning to for a two weeks. – The coffee my friend Ann brought me this afternoon (a decaf but still a nice coffee) and we had a good chat and catchup. 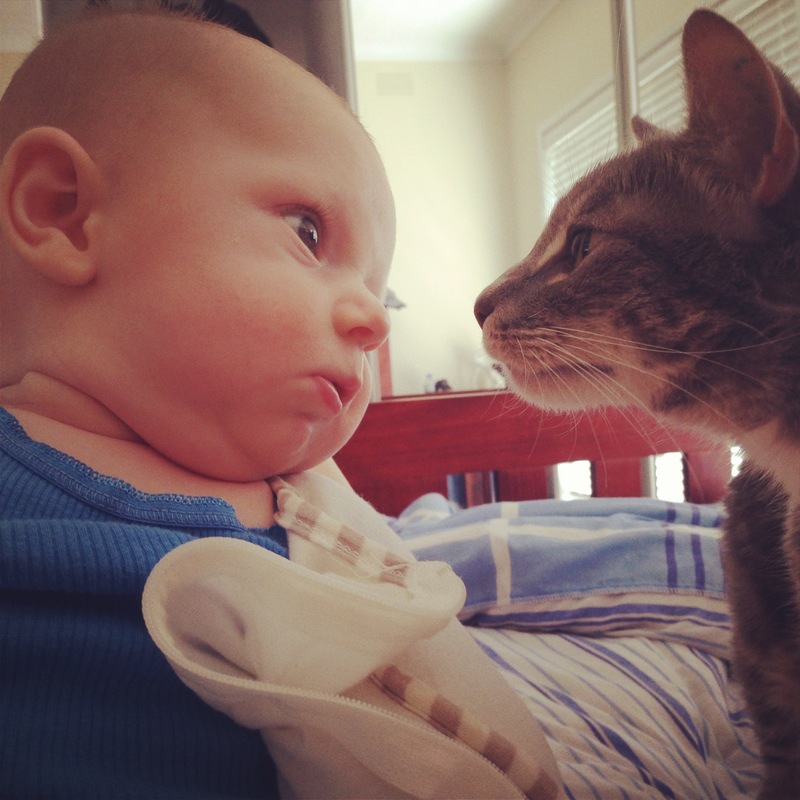 – The photo I got of little man and Matilda the cat. Very cute. All pretty good! The only bad bit about today was the lack of sleep from little man and oh…the SCREAMING. Actually it was just the screaming this afternoon which really did it. Totally did me in. He went to sleep doing a hiccup/sob thing which was really upsetting to listen to, he was obviously in pain from the reflux. I’m not convinced the medication is working as well anymore. Or it could be anything who know! Maybe he didn’t like that I put socks on him this morning. A bad day? Not that bad now that I look back on it. Tomorrow we have mothers group which I always look forward to if only to socialise with other people also battling with a cute but often little demon child. The rest of the week will be pretty busy too. Thursday we have a paediatrician appointment – WTF is with this reflux medication is what I will be asking. Depending on how much sleep I get the night before I may actually say that. Friday we have our 4 month checkup with the child and maternal health nurse. Don’t tell little man but on Monday we have our 4 month needles. FU..N times. Right. Best be off to bed so I get some sleep! I just finished watching Breaking Bad – its only taken me about 20 weeks to finish season 5 but I got there. I don’t think this counts as a spoiler but OMFG. The last few episodes were amazing. I’m glad I stuck with it – easily the best show I’ve ever watched. We’ve had another excellent week with Little Man, with only one bad night where he woke up at 12:30 and screamed for 2 hours. For no reason that I could see. Not a happy camper. I was going to throw in the towel and call in reinforcements (Nanny and Poppy) but managed to HTFU and stick it out. Mum 1 Little Man 0. I have been a single Mum this week while the man is away for work and have been okay – helped by longer sleeps from Little Man giving me a break and some much needed JenTime™ (hence Breaking Bad catch ups). Haven’t managed to do any exercise really unless you count flopping around in the pool during our baby bond class. Which is not really exercise but I am counting as a core workout due to my height and the depth of the pool. Speaking of core workouts Dad and I have been attempting “plank a day”, a 30 day planking challenge. At the end of 30 days you are meant to be able to plank for 5 minutes. On day 16, last night I had my first failure – couldn’t get to 2.5 minutes. To be fair to me 2 minutes was the longest I ever really planked for before getting pregnant so getting over that post baby was always going to be a big ask. I’m pretty stoked I’m back to being able to do it for 2 minutes anyway! Big ups to Dad who did make it to 2.5 minutes. I’ve also been able to get out of the house every day this week, mostly just in the mornings which has been really good. I’m looking forward to the weather cooling down and getting back home as I’ll be able to walk in the mornings. Little man has now graduated to the regular pram without the bassinet which has made getting out heaps easier, one less thing to lug around! 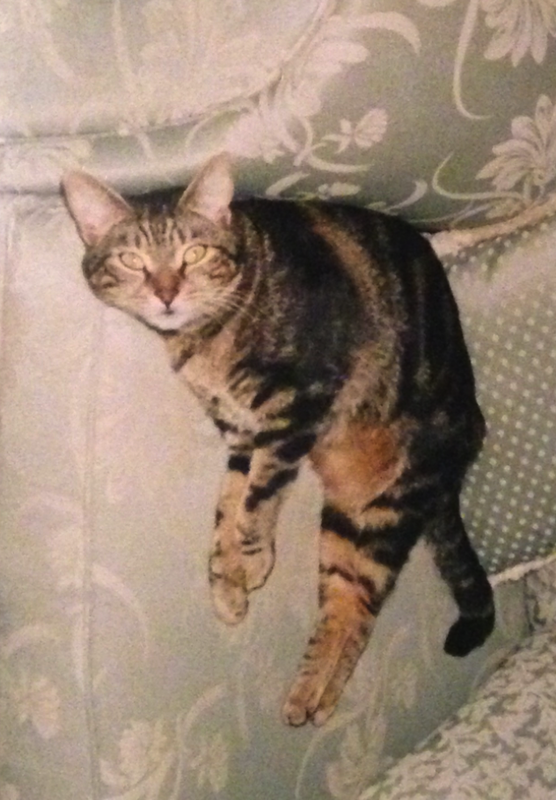 On a sad note we had to have one of our beloved family pets Mags the cat put to sleep this week. She was 14 years old which is pretty good for a cat that was probably on her 9th life very early on after getting mauled by a dog when she was young! This is not a sponsored post, I am nowhere near the kind of blogger that even does sponsored posts, but this might read like one because our robotic vacuum cleaner is the ducks nuts! The man and I have been pondering robotic vacuum cleaners for a couple of months. Are they all they’re cracked up to be? Surely they can’t be that good! Now that we have friends with babies who can crawl, I always feel worried about our floors covered in cat fur, and vacuuming every day is a chore (and I don’t do it so the guilt cycle continues). I thought if this thing is as good as they say then it could zip around every 2nd day, or even everyday! and I’d never have to worry….IF its as good as they say! So while we were shopping for a coffee table on the weekend we had one of the sales assistants run us through how they work, what they can and can’t do etc. The first place we went to was hopeless, the sales assistant couldn’t tell us why one was $500 and why one was $1200, except ‘it has two sensors instead of one’ but then couldn’t explain what they did. We went somewhere else. The next place we went to the assistant was much more knowledgable and said the market now was basically between two cleaners, the Samsung Navibot $1299 RRP and the LG Roboking $999 RRP. Interesting because the ones I’d heard of were Robomaid and iRobot Roomba! The thing about the Navibot is that it empties itself which is pretty awesome but the docking station was massive compared to the Roboking. And lets be honest, I’m already putting my feet up while it cleans my house – pretty sure I can empty it. Both systems return themselves to dock when they need charging. We were much more impressed by the Roboking’s demonstration, it seemed a lot smoother around walls than the Navibot which seemed to bump into things a bit more. It was also the cheaper of the two. We ended up paying a considerable amount less than the ticketed price, so if you’re buying one of these from the big electrical retailers – they have plenty of room to move on price, we picked it up for about $120 less than the ticket price, which was still cheaper than the RRP. I was still hesitant about whether it would be able to get into the carpeted bedrooms from the floorboards as there is that little metal cover to get over but as the sales assistant said, it was fine. The first time it tried to go into a room it almost seemed like it was going to get stuck, but then it went back and got in on the 2nd go, and since then its been straight in, no issues. I also wondered if it would get into the bathroom and toilet as the lip from the floor to the tiles is bigger again, and yesterday it seemed like maybe it wouldn’t, but it was in there today – the only thing it didn’t like was leaving the bathroom as the ‘cliff detection’ obviously came on as it went to exit the room so it took a few goes for it to get back to the floorboards. That brings me to the other thing we weren’t sure about…stairs. We have a wooden stairs which we were concerned such an expensive piece of technology might kill itself on, again sales assistant assured us it wouldn’t happen. Last night we watched, gripping each other in fear as ‘Dusty’ powered itself towards the stairs at full tilt, reaching them then just when we thought it was going over it darted backwards quite quickly. Almost gave me a heart attack – but yes, the cliff detection works perfectly. So, to the bad things. There really isn’t much – but, pack up your cords off the floor, like phone chargers etc. It likes to eat them! Anything not heavy that can be moved, it will try and move e.g the clothes horse, my ugg boots, that pile of clothes the man leaves next to the bed. Its also not as quiet as they make it out to be – I wouldn’t be able to have it running at night as it would keep me awake but during the day or evening would be fine, it is quiet – but not THAT quiet, like a humming noise in the background. The Roboking also talks. When I looked at reviews online before I bought it, I was almost put off because it says you can’t control the volume or make it stop talking. Which is true, but the only time we’ve heard it talk is when it starts (it says a very polite hello and reminds you to empty it when its finished) and then when its battery is low it tells you that its returning to dock to recharge. The battery life is 100 minutes, today it did our kitchen, lounge room, hallway, bathroom, toilet and three bedrooms and then took itself off to recharge – and I’d say that might have been a bit over an hour – but it kept cleaning after telling me it was heading back to charge. One thing I will say is, once you have moved anything edible to Dusty out of the way (like cords) just let it do its thing. If you watch it you will wonder what the hell its doing – it works, its awesome, just don’t question its methods, its kind of like the man watching me mow the lawn. It has two settings, cell mode and zig zag mode. Cell mode divides rooms in a square (cell) and then cleans in a zig zag pattern within the cell. Zigzag cleans the whole room as one big cell in a zig zag. I can’t see much difference between the two, they both work great. There is supposedly a learner mode as well, where you can tell it to avoid particular areas – I will be setting it up to avoid the cats food/water as I’m worried it might knock into the water container and then start sucking up water which is a no-no (another thing to watch for the bathroom – probably don’t run it after you’ve just gotten out of the shower!). It does have a ‘mop’ function where you attach a wipe sort of thing to the bottom, which would be useful on floorboards for picking up dust, but you can’t use that on water/really wet floors and definitely not on carpet. There are long brushes on the sides of Dusty which means it does clean under things like coffee tables, couches, right along skirting boards because the brushes flick dust, dirt, cat biscuits etc out into its suction path. Its quite amazing watching it actually picking stuff up! Below are two examples of what it picked up. 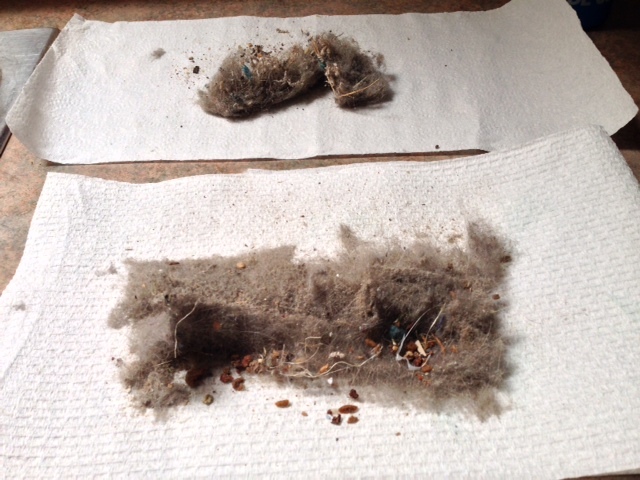 The top photo is of what it picked up on the first 30 minutes of it zipping around with us just seeing how it worked and the second is its first full clean of the house. Amazing!….and disturbing. I also ran it today expecting it to not pick up much seeing we only ran it last night…and it has picked up the same amount as in the bottom photo which is super disturbing! Its got a HEPA filter in it, which I think is fancy code for ‘good for allergies’ as it stops the bad stuff escaping once its picked up. The cats aren’t too freaked out either, they’re following it around although Schroddy is hissing at it. I can’t seem them riding it anytime soon though (see video below). So, final verdict is: if you can afford one, get it. I know its going to save me a LOT of time and I already feel more relaxed about our house – its just so CLEAN!!! Am I lazy? A little I guess but mostly just busy and I know I’m going to be busier and its just one.less.thing. I also feel better about less cat hair about too. Well 30 weeks ended up being a real mixed bag of a week! I’m not sleeping well at ALL and its curtailed exercising in the mornings as getting out of bed is hard enough. I’m still doing fine exercise wise, just have to do something in the evenings instead! I got a 5km walk in tonight, my feeling is anything is better than nothing! And I did feel much better for it. 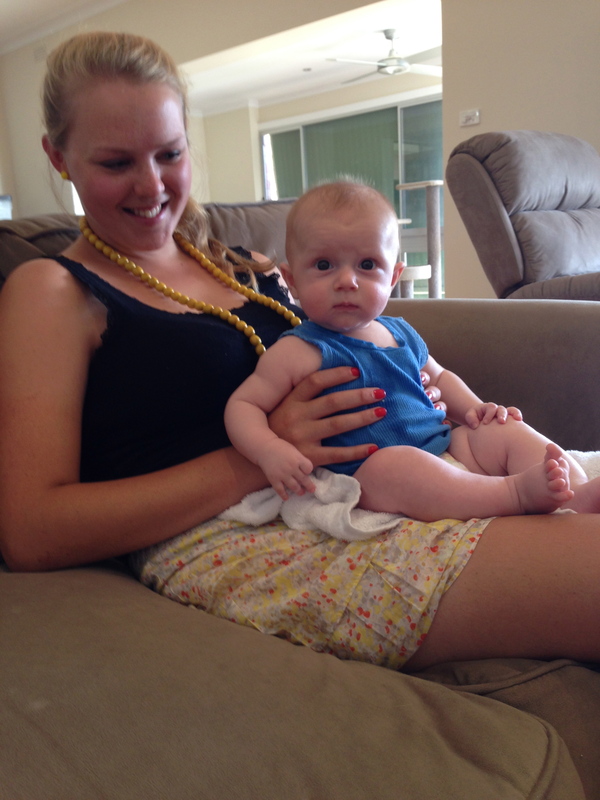 On Friday we went to Berrigan to see George & Bridge, Malachy and little Lennox. Even though we could only see them for a few hours it was still awesome. Malachy adored playing with ‘Fanky’! Saturday morning the man abandoned me/headed to Thailand for work and after dropping him off at the airport I immediately cut down these bushes that have been bugging me along our driveway. I was also going to shovel the pebbles in our front yard into a neat pile, but I was stuffed after that small amount of ‘gardening’. Saturday afternoon Rach arrived for a visit which was great! It was cool to be able to show some actual changes in the house (..and me too I guess). On Sunday arvo we went for a bike path cruise. I didn’t totally exhaust myself and she didn’t die of boredom riding so slowly so I’ll call it a pretty good ride! Also I made it up the hill again with no trouble. In your FACE hill! Monday afternoon I had my 31 week midwife appointment, which I had to go to as a single mother. According to the scales I have lost weight and I was a bit worried at first but apparently everyone was weighing less that day. Phew. Also doesn’t make much sense because then Grape measured at 32 weeks, so – big! I’m starting to wonder if my fear of being late to anything might have already been passed to my child. So hear this Grape, it is okay to not be early this once! But please be punctual. I am loving feeling Grape wriggle around, according to the midwife the head is still down and its back is lying along my right side. I wish I knew how they know that, right now there’s a big lump sticking out my right side, is it a knee? Or is Grape mooning everyone? Meal planning like a boss! I’ve mentioned this before but since getting pregnant all of a sudden I can cook. I realised things were a bit askew when I made a frittata a couple of months ago. A roast vegetable one no less. Then I went a bit soup crazy. Now I’m looking up meal planning and how to make taco seasoning mix from scratch. For the past few weeks now I’ve been shopping on a Sunday/Monday and getting stuff for a whole week. I know thats what most people do but since we moved in together we’ve never been more than a few hundred metres from a supermarket and our habit was to decide what we were eating for dinner on the day. A bad, expensive habit as we ended up wasting a lot of food. When I was training most days after work the man would pick up stuff on his way home from work and generally have it ready to go for me to scarf when I walked in the door. Worked out well for me except if he was tired and then we’d have Japanese. Yes, he cooked me dinner pretty much every night. Yes, I was pretty spoilt! Now that he works longer hours than I do, and I’m not training I’ve taken over the cooking/shopping. Its mostly been a success. I’m not particularly inventive but also the man is kind of a fussy eater. Just texture wise really. He does like most vegies, but not mashed potato (texture). Doesn’t like tofu (texture and also its not meat). Still, plenty to work with. Saturday: I had tofu stirfry. I was craving vegies and brown rice. The man did his own thing, I think he had rice cakes with salad and ham. Okay not a great example to lead off with..
Wednesday: Steak & Veg (defrosted steak we didn’t eat last week that I froze). Thursday: Curried sausages (from scratch – mixed success. Was nice, but too unhealthy for me to eat on a regular basis – very very salty. Could serve with more veg which would mean less of the sausage part and would be nicer). Friday: Chicken, chorizo and bean burritos with whole wheat wraps. Definitely a success. We will add kidney beans to our mexican meals from now on. Have investigated homemade seasoning mix to use instead of packet one. A successful week really. Tomorrow I am making soup. I have a parsnip left over from the soup I made on Sunday and will also use up the rest of the stock from the curried sausages. I also have a leftover bit of chorizo from tonights dinner so will make a lentil, chorizo & vege soup. We are painting all day tomorrow so soup will be an easy dinner for after that. Tonight I worked on a spreadsheet and listed every single meal we eat regularly. What is our ‘go to’ stuff. Then I made another list of things I would like to try and make like zucchini slice (if I put bacon in it the man might eat it) and proper bolognese sauce. It highlighted how much of the same we eat and that I can improve on making stuff from scratch, but that overall we are doing okay. If we have steak and steamed veg twice a week so what. The man has a rule that you have to have four different vegies. Our standard is broccoli, cauliflower, carrot and beans + he has a steamed potato. I am not a fan of plain potato so leave that to him. Unless he’s roasting the potato and then I am IN! So we’re pretty good vegie wise! But could do with some more interesting meals. Anyway, its a massive improvement. And leaves more time when I get home to go for a walk or hop on the trainer for 45 minutes. See, its all happening! Like.A.Boss. I made some changes to Jentopia which include merging jentopiajunior the blog I created for baby related posts into my normal Jentopia blog. I wasn’t sure whether to do that or not but managing two blogs was annoying. I started blogging about a pet crab in 2005, then just random ‘life’ stuff and then it kind of turned into a home for my race reports, and now here I am blogging about a Grape. I think its fine. You don’t have to read about Grape if you don’t want to, or maybe now I’m not blogging about racing you might like to read it more! As for the biscuits, well that just worked out well for a bit of alliteration. Maybe you can witness my rise as a mummy blogger extraordinaire when I start baking and posting recipes. I’d like to do that but I fear lack of cooking ability might get in the way! Thanks Jase for helping with a new tagline! Its been a year since we moved Albury and while a LOT has happened, not a lot has happened on the house. With Grape on the way the renovations have been on my mind. The man, being his usual optimistic self thinks they will be done by November. But I am far too much of a pessimist to believe it. And its easy to say they won’t be done, when you’re not doing anything to make it happen in the first place. We started out well, we engaged an architect who drew up plans..and then things just stopped. That was before Christmas, and before Grape. Now its July. We’ve sold our Melbourne place, and lack of funds to begin renovating aren’t an excuse. We started a couple of weeks ago by getting the final plans from the architect. Then everything ground to a halt again. Went and looked at kitchen cabinetry gizmos and whizbangetry at Lincoln Sentry with our friend/cabinet maker/kitchen installer, Muz. Everything stopped again. I started using pinterest, pinned some kitchen pics I liked. Nothing happened. It has now become apparent to me that if I want this stuff done, I’m going to have to do it. Turns out there is no renovation fairy. How annoying. – Had Alex down to talk about paint colours. As always she had some good advice and I think we’ve got colours sorted. – I nagged the man into just doing *something*, *anything* painting wise and so we sanded Grape’s room. Well almost, we got stuck on the architraves and the ceiling which we’re still yet to do. Had an idea about the way forward on that today though. – Phoned the architect about getting the plans to council. He said he needs our builder and plumber’s details first. Clarified this with the council today, no you don’t need it for the development application (DA) but you do for the construction certificate. – Started builder, plumber, electrician hunting. Do you know tradies don’t use the internet? Most seem to work on word of mouth. Which is bloody annoying when you don’t know any builders! I have got a few listed now, one coming over tomorrow for a quote, and two still to contact. I rang the one our architect recommended and he didn’t answer his phone twice, and no voicemail so I wrote him off. – I am also wanting to get rid of the rocks in our front yard. According to google maps, our front yard used to have beautiful green grass which they have covered over with a layer of what google tells me is ‘aggregate’. So if anyone wants some aggregate, come and get it. So, there you go. Stuff is happening. Soooo you guys are a bit behind. I have a new blog. Yes yes that’s right. We have a Grape on the way. You can read all about it there. In other news, kind of also related to the baby, we’ve sold our house in Melbourne and are renovating our Albury house. I do have a song of the month for you and then I’ll be blogging about our renovations! Hooray something to blog about! For any Grape related updates I’ll post over at jentopiajunior.wordpress.com.